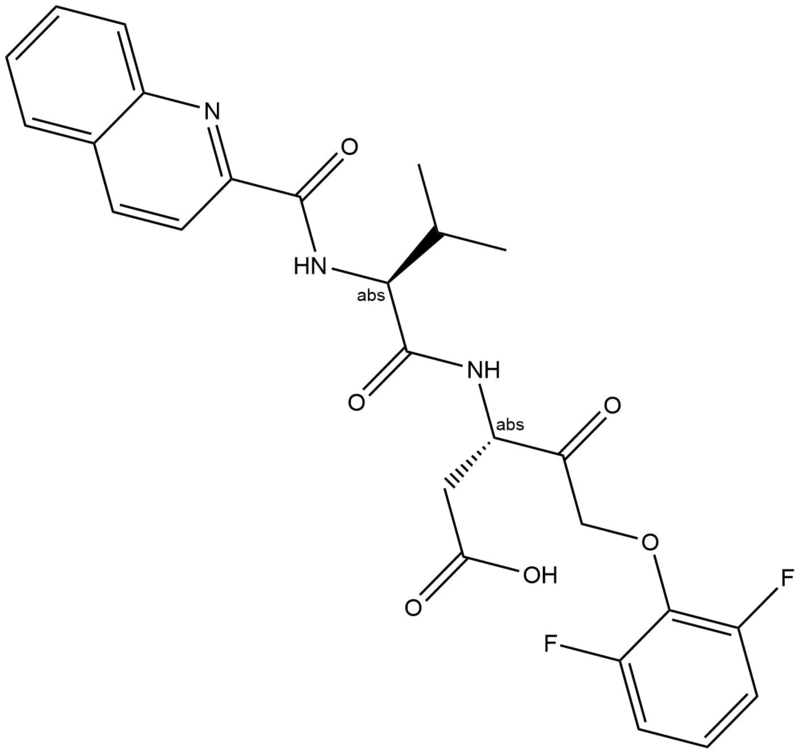 Q-VD-OPH is a selective, brain and cell permeable, highly potent and irreversible inhibitor of caspase-3 ( IC50=25nm), caspase-1 (IC50=50nM), caspase-8 (IC50=100nM) and caspase-9 (IC50=430nM). 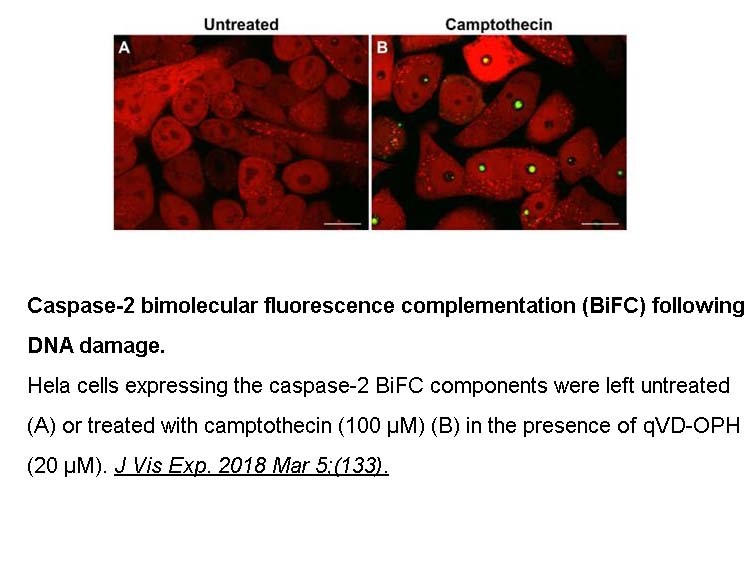 Q-VD-OPh largely inhibited caspase-3 and 7 activity at 0.05 mM. 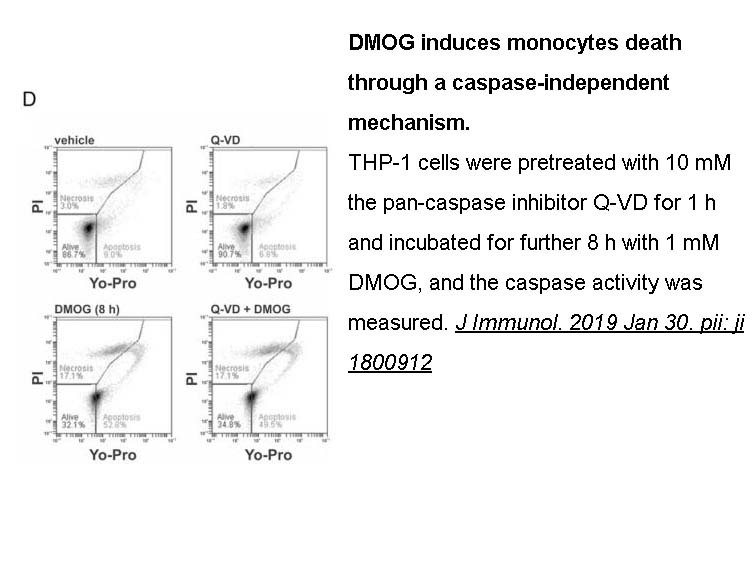 Caspase-8 was also inhibited by Q-VD-OPh at very low concentration. 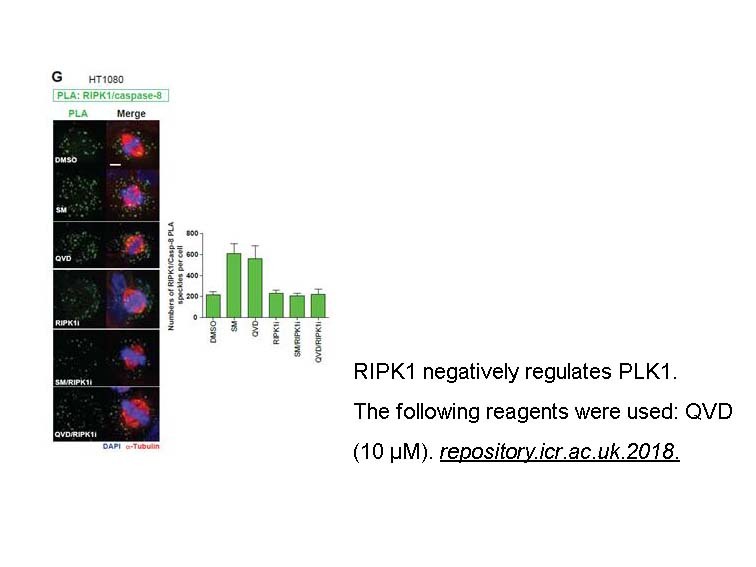 Q-VD-OPh prevented the cleavage of PARP-1 at 10 mM . Q-VD-OPh inhibited DNA fragmentation and disruption of the cell membrane functionality at 2 mM, and the drug-induced loss of cellular adhesivity to fibronectin need 10 mM Q-VD-OPh. Q-VD-OPh inhibited caspase-7 activation and limited the pathological changes of tau and caspase cleavage in chronic treatment of Alzheimer disease. 1. Kuželová K1, Grebeňová D, Brodská B.Dose-dependent effects of the caspase inhibitor Q-VD-OPh on different apoptosis-related processes. J Cell Biochem. 2011 Nov;112(11):3334-42. The broad spectrum caspase inhibitor, QVD-OPh, provides a cost effective, non toxic, and highly speciﬁc means of apoptotic inhibition and provides new insight into the design of new inhibitors1. Actinomycin D rapidly induced apoptosis and this was dramatically inhibited by the caspase inhibitor, Q-VD-OPh (quinolyl-valyl-O-methylaspartyl-[-2, 6-diﬂuorophenoxy]-methyl ketone). Q-VD-OPh was signiﬁcantly more effective in preventing apoptosis than the widely used inhibitors, ZVAD-fmk and Boc-D-fmk. 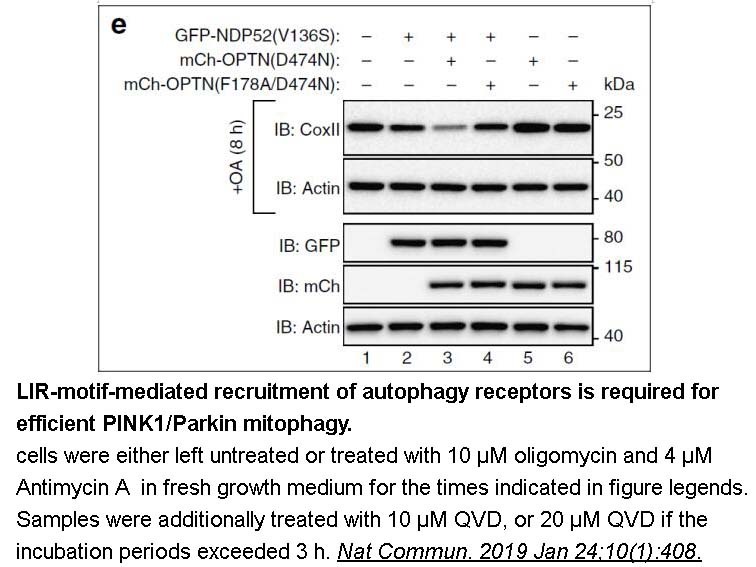 Q-VD-OPh was also equally effective in preventing apoptosis mediated by the three major apoptotic pathways, caspase 9/3, caspase 8/10, and caspase 12. In addition to the increased effectiveness, Q-VD-OPh was not toxic to cells, even at high concentrations. 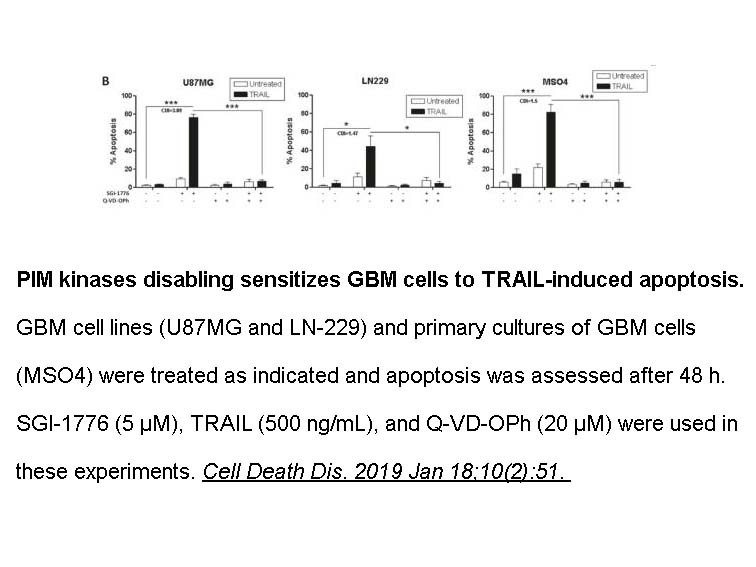 Q-VD-OPh was equally effective at inhibiting the three major apoptotic pathways, was functional in different cell types and species (human, mouse, and rat) and prevented terminal caspase activation, substrate cleavage, and DNA ladder formation associated with apoptosis. Q-VD-OPh can inhibit recombinant caspases 1, 3, 8, and 9 with IC50 values ranging from 25 to 400 nM2. The effectiveness of Q-VD-OPh as an apoptotic inhibitor is evidenced by the complete suppression of an apoptotic inducer capable of inducing substantial cell death in less than 4 hours. 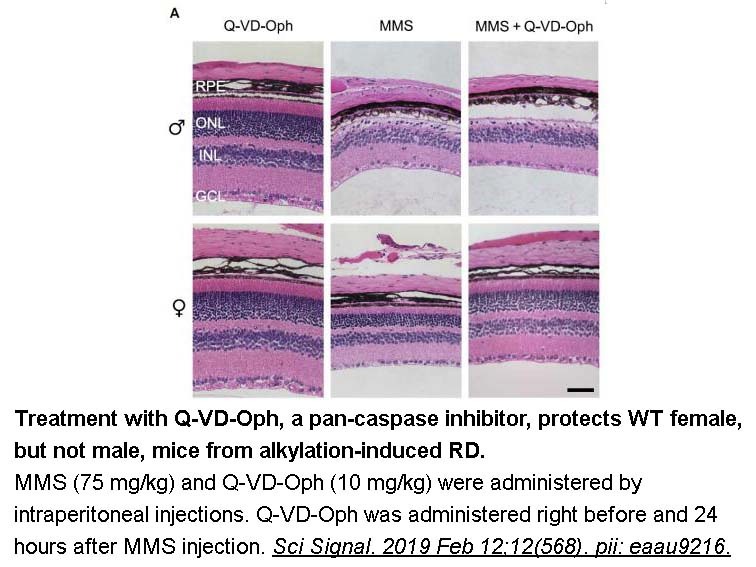 Q-VD-OPh protected against the substantial apoptosis induced by actinomycin D. In addition, Q-VD-OPh alone exhibited little or no toxicity, even at extremely high concentrations. The effective concentration of Q-VD-OPh may provide a unique reagent when trying to revive hard to propagate cell lines from liquid nitrogen. 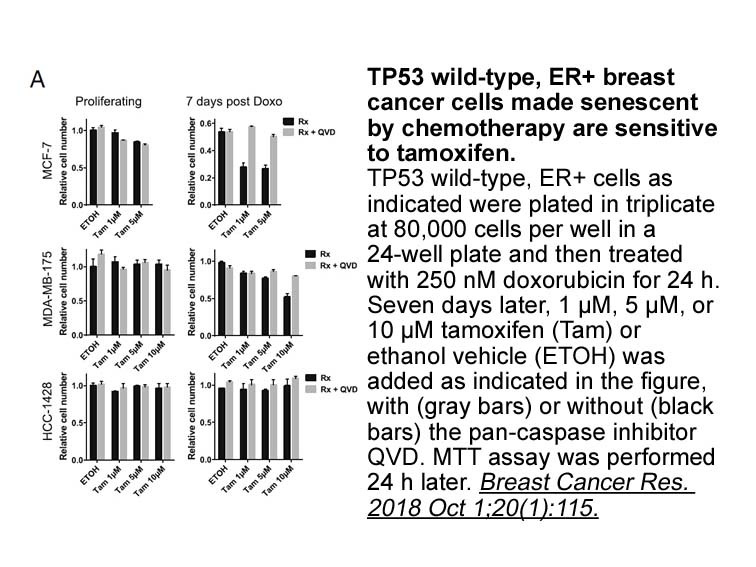 The addition of this inhibitor to thawed cells would give the cells adequate time to recover, even in the presence of standard DMSO concentrations (10%), from the stress of thawing and begin to proliferate in the absence of toxicity. Q-VD-OPh is stable in solution for several months and is effective in culture for at least 2.5 days. This would provide an ideal time frame for cell recovery; whereas, the subsequent decrease in effectiveness over time would be fortuitous in that the cells would return to standard culture conditions with minimal manipulation1.